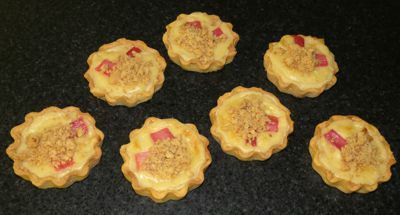 Makes 8 tartlets in fluted 3½ inch flan tins. This recipe uses a lot of egg yolks, the left over whites can be frozen and used for meringues etc., in the future. 1. Make the pastry. Put the flour in a processor with the custard powder and the salt. 2. Add the butter (cubed) and blend for a few seconds until the mixture looks like breadcrumbs. 3. Transfer into a large mixing bowl and add the sugar and egg yolks with about 4 - 5 tablespoons of cold water. 4. Blend the ingredients together until you have a nice soft dough and chill for at least 30 mins. 5. Set the oven to 180°C/Fan. 6. Make the topping crumble by rubbing the butter into the flour until it resembles coarse breadcrumbs and add the sugar. 7. Scatter on to a baking tray and set aside and cook these at the same time as your 'blind' bake pastry base. 8. Tip the pastry on to a floured surface and roll out 4.5 inch circles to fit loose bottomed small 3.5 inch tart tins. Prick all over the bottom with a fork, line with foil or parchment and fill with baking beans. Bake for approx 10 mins, then remove the beans and paper and cook for a further 5 mins. N.B. The crumble may take a little longer, it should be golden and crispy. 9. Next, make the custard. Mix the large egg yolks with 60gms of the sugar, and cornflour in a bowl. 10 Place the cream, milk and vanilla paste into a pan and heat gently until just simmering. Pour the cream over the egg mixture lightly whisking all the time. Return the mixture to the hob and cook until the mixture coats the back of a spoon. Tip back into the bowl, cover with Clingfilm and leave aside. 11. Cut the rhubarb into 2 - 3 cm lengths, place in a bowl and mix in the remaining 70 gms of sugar. Place on a baking tray, dot with the butter a sprinkle over a little water. Roast for 15 mins, strain the juices from the roasted rhubarb and leave to cool a little. 12. 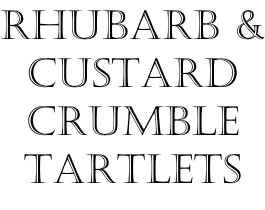 Place 3 or 4 pieces of the roasted rhubarb in the bottom of the pastry cases and pour the custard mix on top and then place a couple of pieces of rhubarb on the top just gently dipping it just under the custard a little. Bake on a baking sheet for about 15 - 20 mins or until the custard is set. Remove from the tins when cool. Sprinkle on the pre cooked crumble and serve warm with cream or ice cream...DELICIOUS! !